Running a 5K — 3.1 miles — can be a fun and rewarding experience, especially if it's your first time. But, even though this is the shortest distance for running races, it still requires adequate training and preparation. Depending on your level of fitness and your goal, the type of training plan you follow will vary. In virtually any town or city across the United States, you are likely to find a number of 5K races throughout the year. This is a distance that draws a lot of beginner runners, kids and veteran runners because preparing for it doesn't require as much time as training for a half-marathon or marathon, making it appealing to busy parents, students and working professionals. Many beginners have the goal of just finishing the race, while experienced runners may have a certain goal time in mind. Either way, training properly is important. As with any fitness program, training for a 5K should be done gradually. It is important to build up a level of cardiovascular endurance as well as muscular strength and endurance in order to allow your body to adapt safely. Depending on your level of fitness before starting a 5K training plan, you should allow eight to 10 weeks to build up to running for 30 minutes, which is the approximate time it will take a beginner to complete a 5K, according to the American Council on Exercise. Trying to train in a shorter period may not be enough time to strengthen your legs and your lungs, although if you already have a good level of fitness from other sports like swimming and running, you may be able to do so in two to four weeks. When first starting a 5K-training program, you should be able to walk at a brisk pace — 15 minutes per mile — for 30 minutes. If you cannot, you should build your walking distance first. 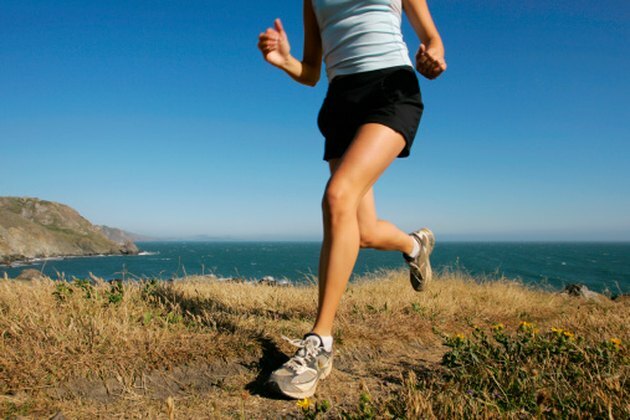 Once you are ready to add running to your workout, do so gradually with a mix of walking and running. ACE Fitness recommends running for 2 minutes followed by walking for 4 minutes and repeating 5 times for a total of 30 minutes. As you progress each week, gradually reduce the walking portion while increasing the running portion until you can run for 30 consecutive minutes. According to masters champion runner and running coach Hal Higdon, varying your training throughout the week is the key to a successful 5K training plan. In his novice 5K plan, he advises running three days a week and walking one to two days a week. On the other days, he recommends that you rest in order to allow your muscles to recover and get ready to run again. Higdon also recommends a gradual increase in your running distance over the course of eight weeks starting with a 1.5-mile run and building up to 3 miles. For Higdon's complete 8-week training plan, see the recommend resource below.